(TheForceField.Net ) February 1, 2008 – The Better Business Bureau is one more company to be spoofed in an e-mail phishing scam. The BBB, an organization known for its accreditation and promotion of high business standards, first issued a security bulletion warning users of the scam in June 2007. yesterday the BBB updated the bulletin in response to a new wave of phishing e-mails. The BBB insists none of their computer and e-mail systems are involved in the hoax and posted instructions for the submission of e-mail data to attempt to identify the source of the malicious e-mail. Savoia Computer received one such e-mail yesterday. The e-mail, allegedly sent from "Better Business Bureaus" seatac@bbb.org, announces BBB Complaint Case #509283364(Ref #34-7243238-52900969-4-735) in the subject line. The e-mail claims to contain information about a complaint filed with the BBB against the recipient. It claims the recipient is a member of the BBB. The body of the message contains the recipient's e-mail address and name as well as a recent Case Opened date. Do NOT click on any of the links or open any of the attachments. Please help us in our work with the authorities by forwarding the email and its headers to phishing@cbbb.bbb.org. Instructions for Outlook users are below. Open the message (not the attachment), select ‘View’ from the menu, and then ‘Options’ from the drop down. Or, right click the message in the list of emails and select ‘Options’ from the menu. At the bottom of the Message Options dialogue box that opens is a box labelled "Internet Headers" which contains the information we need to track the attacks. Select the information in the box and copy it by hitting Ctrl-C on your keyboard, or right-clicking your mouse and selecting "Copy." Close the dialogue box and select "Forward" in the message. Paste the headers at the top of the message and address the email to phishing@cbbb.bbb.org. Popular wiki hosting provider, Wikidot.com, is opening its software by releasing the codebase under the open-source GNU Affero General Public License version 3. Lewes, Delaware (PRWEB) January 31, 2008 — Wikidot Inc., developer of the popular Wikidot.com platform has freed the code for its flagship product under the new GNU Affero General Public License version 3. The company has freed both its current Wikidot product, and the new Wikidot/2.0 product under development. Wikidot Inc. founder and General Manager Michal Frackowiak explains, "our users want access to the code, and we want our users to get involved in the project. We believe that freeing our software is great for our community, and great for our business." The Affero license gives users the right to modify, share, and even resell improvements to the code. Michal explains, "it's like the GPLv3 but also requires service providers who extend our Wikidot code to share their improvements". Wikidot.com is growing popular with smart users who use its wiki functionality to build creative sites, quickly. Pieter Hintjens, founder of iMatix Corporation and CEO of Wikidot Inc., explains, "it used to take weeks to build a website. With Wikidot my team can make new rich sites in a matter of hours. It's all about doing more with less." Through pure word-of-mouth, Wikidot now ranks as one of the most popular wikifarms, and is growing at the rate of 500 users a day. Michal Frackowiak concludes, "we deliver a quality product and a very reliable service. Our users are our best sales people." Software is available free of charge to everyone at wikidot.org. Wikidot Inc. is a privately-held corporation based in Delaware, US, with an operating office in Poland. The firm was founded in 2007 by Wikidot.com founder Michal Frackowiak and a group of private investors. 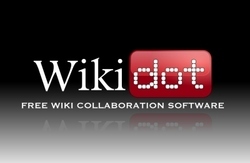 Wikidot.com offers users the ability to create websites using "wiki" technology as used in Wikipedia and other products. Wikidot.com offers freedom from advertising, and free hosting for its users' websites. The company makes revenues from opt-in advertising and add-on services. The 2007 ISO 27001 Benchmark Study shows many organizations have gaps in their governance of information security. 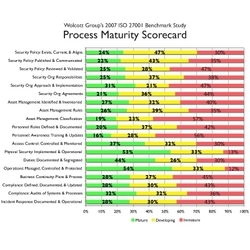 Fairlawn, Ohio (PRWEB) January 31, 2008 — New research from Wolcott Group (www.wolcottgroup.com), "The 2007 ISO 27001 Benchmark Study," shows that many organizations have significant gaps in how they manage information security. While most organizations have mature or developing controls for information security, many still have immature processes for key issues like security policy training, access control, asset management, business continuity, IT compliance auditing, and more. "One of the most significant findings from the study is that nearly half of the respondents rated their organization's approach to managing information security as 'initial' or 'non-existent'," stated Gary Sheehan, CISSP, HISP, managing consultant for information security at Wolcott Group. "Essentially, this study demonstrates the need for organizations to adopt a more holistic approach to managing information security like ISO 27001/27002." "The 2007 ISO 27001 Benchmark Study" was based on a 20-question self-assessment survey that explored the major aspects of how organizations govern information security as it is aligned with the ISO 27001 international standard and the ISO 27002 best practice framework. The study had 89 participants from a variety of industries, with 88% being in an IT management role, and 62% from organizations with over 1,000 employees. Interested parties can visit Download The 2007 ISO 27001 Benchmark Study to register to download a complimentary copy of the benchmark study. On February 27, 2008, Wolcott Group will host a webinar to expand on the study's findings as well as cover some best practices for managing information security using the ISO 27001/27002 framework. For more information and to register for the webinar, please visit Register for the ISO 27001 Webinar. The online ISO 27001 self-assessment that was used to collect the data for the benchmark study is still open for use at Take the ISO 27001 Online Self-Assessment. The self-assessment enables organizations to benchmark their information security practices against the ISO 27001 standard and their peers. Wolcott Group is one of the top U.S. firms for standards-based, information security training, consulting, and technology solutions. Wolcott Group is a member of the IT Governance Institute, an authorized training center for the Holistic Information Security Practitioner (HISP) certification, and an authorized BSi Management Systems' Associate Consultant for training and consulting on ISO 27001/27002. Wolcott Group is an IBM Premier Business Partner, a Microsoft Gold Certified Partner, and also partners with other information security technology vendors to help its clients to improve their information security practices. For more information, please visit Wolcott Group's web site. Winners will be recognized at Software Marketing Perspectives Conference & Expo. Oakbrook Terrace, Ill. (Vocus/PRWEB ) January 31, 2008 — The Computing Technology Industry Association (CompTIA) announced today that nominations are now being accepted for the second annual SoftwareCEO Software Innovation Awards. Software companies, software service providers and companies serving the software industry are eligible for the awards, which will recognize technological and business model breakthroughs that deliver innovations in software and content delivery. Products, ideas, services, companies, and business models are eligible. The second annual SoftwareCEO Software Innovation Awards will be presented at the Software Marketing Perspectives Conference & Expo May 7-9, 2008 at the Santa Clara (Calif.) Convention Center. Scope of the innovation – What business problem or opportunity does the innovation address and what is the size of the problem or opportunity? Impact of the innovation on software or the software industry – What practical results (such as sales, users or profits) has the innovation had on a software product or the software industry? Innovations must be new and have both a current and future impact. How novel is the innovation? How does the innovation break with traditional ideas or processes? A panel of industry experts will evaluate the nominations and determine finalists and Software Innovation Award winners. For complete rules and other information, visit http://www.softwareceo.com/awards/innovation_awards.php. SoftwareCEO is a resource-packed electronic newsletter and web portal built by software executives for software executives. It is "Page One" for software industry information and education on topics such as software marketing, sales, business, pricing, financing, and services. For more information, visit http://www.softwareceo.com/. The Computing Technology Industry Association (CompTIA) is the voice of the world's $3 trillion information technology industry. CompTIA membership extends into more than 100 countries and includes companies at the forefront of innovation; the channel partners and solution providers they rely on to bring their products to market; and the professionals responsible for maximizing the benefits organizations receive from their technology investments. For more information, please visit www.comptia.org. This week we talk to an insurance professional and discuss the need and importance of insuring your IT business. Cisco unveiled the new Nexus 7000 series switch today. Designed for data centers, the switch is the first of a new series of data center class switching products called the Cisco Nexus family. Sam’s Club, the wholesale company owned by big-box giant Wal-Mart, launched Sam’s Club Online Services now offers a bundle of online services including design, marketing and website hosting. Microsoft issued a security bulletin January 8 advising users of an important TCP/IP vulnerability in Windows which allows an attacker to send malicious packets and effectively take control of a compromised system. Last Friday the company updated the bulletin to include Windows Home Server and change the exploit from important to critical. Sponsored by PC-Doctor Service Center 6. 1-866-BUY PCDR. Mention The Force Field podcast for $49 discount. Offer good until January 31, 2008. When starting a IT business one of the many costs to consider is insurance. Whether you have a home office or a retail store front, you will have liabilities and assets, and they will need to be insured. There is one insurance company that specializes in covering the computer professional. The company is called TechInsurance and its President, Jim Cochran, focuses specifically on the IT industry to help techs find the coverage they need. This week we are going to talk to Jim, learn about the different types of insurance available and find out how much insurance we really need or if we really need it at all. Free network monitoring and diagnostic solution available now. San Francisco, Calif. (PRWEB) January 29, 2008 — PacketTrap Networks (www.PacketTrap.com) today announced that the IT community can now download and try pt360v1.1, a highly-differentiated network management solution that helps users streamline network monitoring and diagnostic tasks. The open beta program gives users a peek at a new Cisco configuration application that allows users to download, edit, compare, upload, and archive configuration files as well as decrypt passwords for Cisco products using a single network management tool. It also premieres a redesigned interface that includes new time saving and enhanced productivity features such as one-click diagnostic tool runs and full screen mode for ptDashboard. PacketTrap's pt360v1.1 also includes recently-added features such as Syslog server, disk utilization, and network utilization gadgets. The Beta is available now at http://www.PacketTrap.com/download/download_pt360.html. In less than eight weeks, there have been more than 7,000 registrations of the pt360 Network Management Tool Suite. It is being used by customers from Boeing Corporation, Cisco Systems, IBM, Home Depot, Pfizer, State of Alaska, US Navy and Volvo Corporation. "It is incredibly rare to be able to accomplish everything you need using only one tool; the reality is that additional tools are usually necessary and because of the plethora of tools available, the challenge is selecting the right tools," said Larry Burton from Enterprise Management Associates. "The newest release of pt360v1.1 includes the best Cisco configuration tool I've seen to-date, which stays committed to PacketTrap's mission to integrate and simplify. Users will definitely be interested in this one." "The advances in pt360v1.1 demonstrate PacketTrap's dedication to and understanding of the IT community and their network management problems," said Steve Goodman, CEO of PacketTrap. "Our network management tool suite makes use of an iGoogle gadget-like GUI that includes essential proprietary and open source tools so network engineers can quickly diagnose and rectify a network problem. Features such as device groups, favorites and powerful dataflow capabilities are what differentiate pt360 from other network monitoring vendors." PacketTrap is favored among the IT community for its seamless integration of network monitoring and diagnostic tools into a centralized dashboard. PacketTrap's flagship solution, the pt360, provides IT professionals with a 360 degree view of their network and lets them discover, monitor, and manage their IT infrastructure from a single screen. The suite includes Cisco configuration tools, a TFTP server, WMI, SNMP, and Port Scans, and gadgets to monitor all flavors of operating systems and servers. PacketTrap is committed to providing affordable and robust alternatives to needlessly complex, poorly supported marketing offerings. Partnership leverages Tilana’s advanced application and Hostway’s exceptional infrastructure and support services. Chicago, Illinois (Vocus/PRWEB ) January 29, 2008 — Hostway Corporation, the global Web hosting leader, is pleased to announce a new partnership with San Diego-based Tilana Systems Corporation. Under the terms of the partnership, Hostway will provide managed hosting services for Tilana’s storage platform, including system architecture and monitoring, billing, provisioning, and customer relationship management tools. Also, Hostway is now offering Tilana’s unique data management solution through its Gate.com hosting brand. Tilana Reserve is a premium online data management service that includes encrypted CDP (continuous data protection), folder and file sync across multiple computers, and automatic unlimited versioning, all through a secure and Web accessible Personal Digital Archive™. The service goes beyond the basic online backup-archive-retrieval model, first by providing the best implementation of each component, but further by also including an innovative combination of features, functionality, and pricing. In addition to providing infrastructure and customer support services to Tilana, Hostway is also marketing the data protection service through its Gate.com hosting brand, under the name GateVault. The service features a unique pricing structure called PayOnceTM. For a $2 per GB one-time fee, subscribers can store any personal or business media, whether it’s a backup copy or offloaded as an archive. Ongoing access to the remotely-stored data is an unchanging $14.95 per month, regardless of how much space is consumed in the data center, and additional storage space is always available at the same PayOnce $2 per GB. GateVault launched in December and is fully available to both current and non-Gate.com customers. The desktop software is a free download, installs in about a minute and requires little configuration. Users can enable an unlimited number of computers and selectively protect and synchronize files and folders on those computers using a single GateVault account. After initial all-file upload, data transmissions containing any saved changes to protected files are quickly transferred to the data center where they are stored in the user’s personal remote storage for as long as needed. Version histories are immediately available through the desktop software or through the Web interface, which can be securely accessed from most PC and smart phone browsers. For more information on GateVault, visit http://www.gate.com/online-backup/. Hostway Corporation provides domain name registration, Web hosting and ecommerce, colocation, managed dedicated hosting, SaaS hosting, Web design and online marketing services to more than 600,000 customers and over 2 million Web sites worldwide. It operates state-of-the art data centers that reduce the complexity and cost of Web-based technologies for small businesses and large enterprises. Founded in 1998, Hostway is one of the world’s largest Web hosting companies with a direct presence in 11 countries, 15 worldwide operation centers and more than 700 employees. San Diego based Tilana Systems Corporation makes storage useful, by combining continuous data protection, permanent archival, web access, version history, and multi-computer synchronization into one affordable service. Tilana Systems Corporation’s first product offering, Tilana Reserve, uses software installed on the desktop to securely transmit files between the user’s protected PCs and personal remote storage space. Please visit the Tilana web site (http://www.tilana.com) for more information on Tilana Reserve and Tilana Systems Corp.
Consumers and DIYers can now get all the information they need to repair their cars like a pro. Fountain Valley, Calif. (PRWEB) January 29, 2008 — Equus Products, Inc., automotive aftermarket manufacturer, announced today the release of Its CanOBD2.com® website, which delivers a comprehensive RepairSolutions™ system to end-users. It is designed to compliment the company's INNOVA® branded "Check Engine" tools, headlined by the #3100, which is the industry's number-one selling OBD2 tool with over 400,000 pieces sold. A major industry milestone, this VIN-specific, Internet-database repair solutions portal is expected to revolutionize the way do-it-yourselfers and consumers approach automotive repairs. "The CanOBD2 website and RepairSolutions database have been under development for over a decade, and mark a major milestone for our company and the industry," said Keith Andreasen, ASE double-master technician and Innova's director of technical services. "Yesterday it was acceptable to sell tools to people without offering them any help in solving their problems. Today, we have raised the standard of OBD tools. Not only will customers be able to get our popular selection of tools and ASE-certified technical support, but now we can provide them with a complete repair solution, including how to fix their problem." 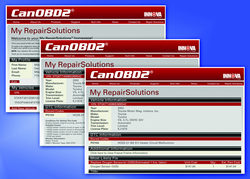 The CanOBD2.com website also features technical service bulletins (TSBs) and vehicle recall information; support from ASE Certified technicians; and information about the INNOVA line of tools; with more features and functions planned in the future. More importantly, RepairSoutions™ offers users the opportunity to purchase a comprehensive Advanced Report. This advanced report, which costs under $10, even provides estimates on parts needed for the repair, labor time required, plus TSBs and recall information. With nearly one million OBD2 tools sold in fewer than six years, Innova Electronics is a leading developer of diagnostic tools for the automotive aftermarket. According to Andreasen, the company prides itself on listening to its customers and providing the most comprehensive technical support for its products. "About a third of all calls received into Innova's technical call center were from people asking how to fix the code displayed on their diagnostic tool. Now, all they have to do is plug their tool into a PC that will automatically launch CanOBD2.com and MyRepairSolutions personal portal, using the included RepairSolutions software, to provide knowledge on how to fix the problem and repair the vehicle themselves," said Andreasen. "Previously you could get repair solutions from books or by subscribing to an online service, but until now you couldn't pinpoint the problem specific to your particular vehicle and particular situation – and certainly not at such an affordable cost. CanOBD2.com's RepairSolutions is like CliffNotes® for car repairs. It literally takes you right to the page, paragraph and diagram you need to get the repair done right the first time." Innova's RepairSolutions knowledgebase has been under development for over 10 years, and includes thousands of fixes for thousands of actual in-use vehicles, input by a nationwide network of thousands of ASE-certified mechanics. It is supplemented by OEM data; licensed information from Thompson Delmar; and updated as well as validated daily by members, consultants and ASE Master technicians. It includes diagnostic data and solutions for most 1996 and newer OBD2-compliant cars, light trucks, minivans and SUVs – foreign and domestic. When Equus Products introduced its INNOVA® 3100 OBD2 Diagnostic Tool, it took the automotive DIY industry by storm with its ease of use and price point. That was six years and over 400,000 pieces sold ago. Today, the demand for these OBD2 tools shows no sign of slowing. DIYers, professional technicians and consumers are looking for efficient ways to diagnose "Check Engine" light issues. In addition to the debut of CanOBD2.com and RepairSolutions, the company continues to expand its family of OBD tools, with the recent addition of its INNOVA® 3130 CanOBD2® Scan Tool and the INNOVA® 3120 CanOBD2&1 Tool KitTM. Both include powerful PC-based shop software and are Internet flash updateable for future coverage. Innova tool owners can quickly and easily join RepairSolutions by plugging their tool into their PC and clicking "upgrade" when the current software launches. And if you don't own a CanOBD2 tool, you can still benefit from RepairSolutions. Just visit www.CanOBD2.com for more information. Fountain Valley, Calif.-based Equus Products, Inc., is an ISO 9001: 2000 certified company, and a leading manufacturer and distributor of test equipment, gauges and tachometers for the automotive aftermarket. Celebrating a quarter century since being founded in 1982, the company markets and distributes its line under the EQUUS® brand to major retail and WD accounts throughout the U.S. and Canada. In 1990, Innova Electronics Corporation was acquired for research, design and product development. Products developed under this division carry the INNOVA® brand. The company's automotive test equipment is sold at more than 12,000 retail outlets in North America. The company's products are supported by a team of ASE Certified Technical Support via toll-free 800 number and website. For more information, visit www.CanOBD2.com or www.iEquus.com, or email: sales@iEquus.com. Amazon.com customers can now use Thrrum Cameraphone Search to click, shop and buy products visually. Mountain View, CA (PRWEB) January 29, 2008 — 23half Inc., a pioneer of technologies that extend the functionality of camera phones, announced the capability to purchase products from Amazon.com using their Thrrum Cameraphone Search mobile phone software. The addition of the purchase capability enables users of Thrrum Cameraphone Search to not only find and research products visually using their cameraphones but also order them from Amazon.com using their phone. Thrrum Cameraphone Search is available for download from http://www.thrrum.com. "Thrrum Cameraphone Search has been the first commercial product to offer the exciting visual click-to-search feature," said K. Gopalakrishnan, CEO of 23half. "Now with the purchase option, Thrrum Cameraphone Search offers the complete shopping experience from price lookup to shopping for alternatives to payments and delivery, in a visual paradigm, powered by the camera in your phone. Users of camera phones can point their camera phone at a book, a product label or any printed material, click to get relevant search results, and order the product right inside the Thrrum Cameraphone Search software on their phone. With Thrrum, your camera phone is the bridge between the product you have in your hand and the products you want delivered to your home." With more than 500 million camera phones sold annually, Gartner Research predicts camera phones sales to exceed 1 billion by 2010. Combined with ever increasing adoption of wireless data connectivity, the connected camera in phones presents a new platform for innovation. Thrrum Cameraphone Search brings together visual recognition technologies and information search in the context of camera phones. Based on technology first demonstrated by 23half in 2005 in the "nThrum" technology demonstrator, Thrrum Cameraphone Search presents a unique 1-click approach to hyperlinking physical objects with related information. The Thrrum Cameraphone Search technology is protected by an extensive suite of patents pending worldwide. 23half Inc. is a Mountain View, CA based developer of wireless information services. 23half's premier contextual information service for camera phones, Thrrum Cameraphone Search, transforms camera phones into visual information browsers for the physical environment. 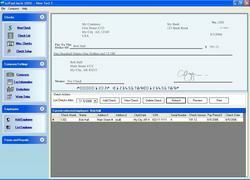 2008 ezPaycheck Payroll Software was designed with help from the same customers who use it, so it is arguably the most user-friendly product to ever hit the market. Louisville, KY (PRWEB) January 29, 2008 — The champagne has barely lost its chill from ringing in the New Year, but already small business owners are stressing over the looming tax season. But 2008 should be a year to celebrate for those who hate to do taxes and get overwhelmed by accounting and payroll headaches, thanks to newly revamped payroll software from ezPaycheck. "We intentionally engineered this software for those end-users who are not professional accountants and payroll tax experts," explains Dr. Mark Ge, President and Founder of ezPaycheck. "You don't even need to have much knowledge of computers. We believe small business software should be simple – stupid simple – so that owners can focus their time and energy on running their businesses, not trying to figure out how to run payroll software." The affordable, super-simple, custom streamlined payroll and tax software – available at http://www.halfpricesoft.com/index.asp – was designed with direct input and guidance from those who use it "in the trenches" every day. The newly upgraded version of the already popular product was updated with new state and federal tax tables, plus other intelligent changes recommended by customers. "We believe payroll and tax software should be designed for the non-technical people who are actual end-users," explains Mark Ge, President and Founder of ezPaycheck. "We always keep in mind that our customers are small business owners, not computer whizzes or financial gurus. But that makes them the best possible people to listen to when designing payroll software, so we include them as members of our design team." 2008 features based on recent customer feedback include fresh new report formats, label changes, and the elimination of minor report display and printout "bugs". The software can be used to report employee wages and salaries to federal, state, and local agencies, with a duplicate copy for the employee. Users also now have the option of manually adding local tax information for jurisdictions such as California, where this is particularly important. A sample company database eliminates the need for configuration of the software. You simply install it and it is automatically ready to print the first sample check, on either blank computer checks or preprinted checks. The payroll software automatically calculates Federal Withholding Tax, Social Security, Medicare Tax and Employer Unemployment Taxes, and includes built-in tax tables for all 50 states and the District of Columbia. With ezPaycheck you can also simultaneously manage payrolls for multiple companies. Thanks to this multi-tasking feature, ezPaycheck software is even used by professional accountants to help process multiple client workloads at the same time. Best of all, the company offers a 30-day free trial. No registration is required and there is absolutely no obligation, giving business owners a good reason to continue celebrating all year long.